Defender / Meterman - "Hemispheres"
Defender has kindly shared several unreleased live performances with us and having fallen for their Krautrock and sometimes avant-garde electronics I was thrilled to finally see an official release by the band. Hemispheres is a split LP with New Zealand band Meterman, and is considered an advance teaser for the full length Defender debut which will hopefully be released some time this year. The band is the Chicago based trio of Jorge Ledezma on guitars and keyboards, Gabor Meszaros on bass and keyboards, and Angel Ledezma on drums. Defender clearly wear their Krautrock influences on their sleeves, but this instrumental outfit pay a fitting tribute to the genre's various stylings while managing to retain a fresh and exciting sound. 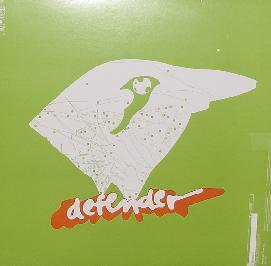 The Defender side of the album consists of two tracks. "Please and Thank You" is an excellent tune imbued with the rhythmic pulse of Can and the quirky electro melodies of Neu!. "Aim High" is more electronic driven, featuring more of those Neu! styled melodies with a cool combination of keyboards and piano, though the drums keep a steady Rock pace and give the music a fuller band sound. I'm really looking forward to a full length from these guys. I've never heard of Meterman and the Someoddpilot web site has little information about them. But I was impressed by their high energy rock songs with robotic post-rock grooves and a nice dose of thrash. The guitars create a blazing attack while the synths temper the atmosphere with an alien vibe. In some ways they bring to mind a more rock and roll version of Finnish band Circle. But Meterman also at times display similar styled Krautrock influences that Defender do, making them an interesting contrast for this split LP, but also the perfect partner. Overall, an intriguing blend of New wave, punk, space electronics, and post-rock. I'd love to hear more from these guys. For more information you can visit the Someoddpilot Records web site at: http://someoddpilotrecords.com. Contact via snail mail c/o Someoddpilot Records; 3711 N. Ravenswood Ave; Chicago, IL 60613.